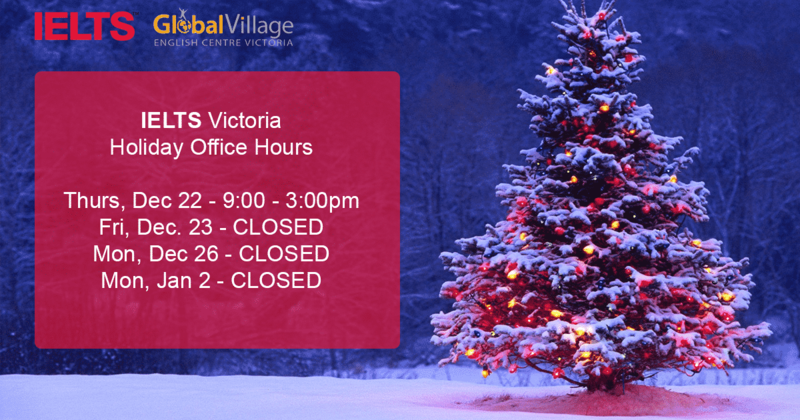 The IELTS Office at Global Village Victoria will be closed on December 23rd and 26th, and January 2nd for the holidays. We will also be closing earlier on December 22nd at 3:00pm. If you would like to register for a test, you can do so at any time online. Visit our Test Dates Page for upcoming test dates. If you have any questions or concerns, please visit our Frequently Asked Questions page. For other inquiries, please email ieltsvictoria@gvenglish.com and we will get back to you on the next open business day. We wish all of our candidates a safe and joyous holiday season.